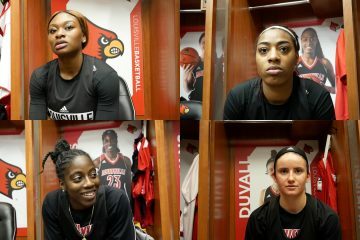 The consensus #2 Louisville women’s basketball team (21-1, 8-1) returns to the KFC Yum! Center Thursday night for a showdown with the #15/#14 Orange of Syracuse (17-4, 6-2). Just a week past a program defining win against the Huskies of UConn, the Cardinals face a high caliber Syracuse team replete with international talent. And yet none of the Orange squad hails from the Netherlands. Talk about a pedantry overload. The match-up with UConn last Thursday marked the beginning of a nine game stretch in which the Cardinals have or will have faced five teams in the RPI top 30. While Louisville has no doubt had its mettle tested, the downhill slope to the ACC and NCAA tournaments is peppered with obstacles. The first gate on the slalom course is Syracuse; here are some keys to Cardinal victory. Syracuse junior guard Tiana Mangakahia is good. Like, really good. The 23 (nearly 24) year old Australian leads the ACC in assists at 8.1 per game and is second in the country behind (by a hair) Oregon’s Sabrina Ionescu. Tiana can pass the ball and so much more. She’s demonstrated as much with a triple-double against North Carolina along with four double-doubles throughout the rest of the season. One of Syracuse’s more disappointing losses was when they laid a wet fart against Georgia Tech. In that game Mangakahia was held to five points and six assists due in part to the Orange’s inability to counter the Wreck’s zone. 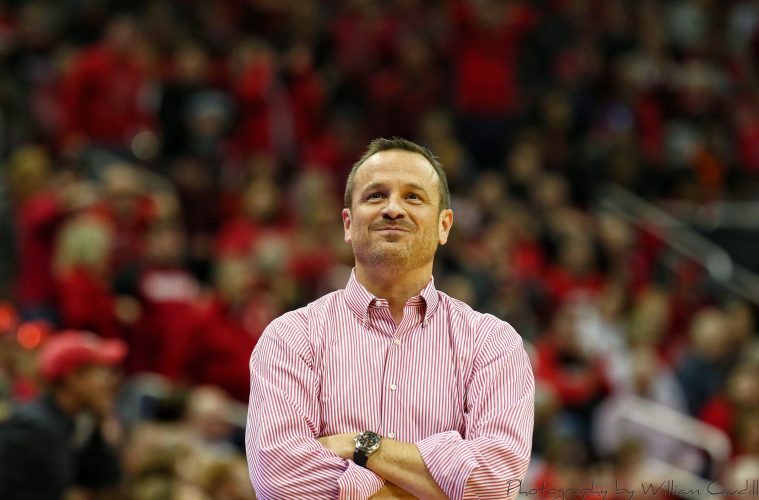 While Jeff Walz and crew will likely stick with the traditional man (person?) defense, their athleticism should provide sufficient mobility to counteract Syracuse’s ball movement. Defensive prowess has served the Cardinals well over the past four games, and shutting down the passing lanes will be key for the contest against the Orange. As for assists, I will pay good money if Dana Evans walks up to Mangakahia at half court and says, “That’s not an assist. THIS is an assist,” as she does a no-look to Asia. This joke brought to you by my unholy obsession with Crocodile Dundee. The Orange tout a strong contribution from the bench led by redshirt freshman Maeva Djaldi-Tabdi and redshirt sophomore Kiara Lewis with 10.1 and 8.3 points respectively. Neither has started a game this season but both are averaging about 20 minutes on the court. Syracuse’s size inside manifests primarily in the personage of 6’4″ Amaya Finklea-Guity. But the sophomore center is barely spending 15 minutes per game in the action and averages a mere 6.6 points and 3.4 rebounds per game. 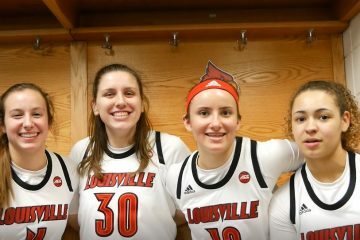 As for Louisville, contributions from both Kylee Shook and Dana Evans will be important to a Cardinal win and fortunately both have proven to be consistent contributors. Evans is coming off a stellar week and is now averaging 10.5 points, 3.8 assists, and 1.5 steals per game. Shook sat the bench most of UConn, but came out firing against Clemson to notch a career-high 15 rebounds. That’s not to say nothing of freshman Mykasa Robinson and her good showing over a stretch of increased playing time. All told, Jeff Walz and crew should be able to rotate through the lineup and provide more than a match-up for the Orange’s bench scoring. Syracuse head coach Quentin Hillsman has been indoctrinated into the School of Boeheim, and he’s an ardent believer. The Orange will likely stick with a zone against the Cardinals, and countering that will be a must. On Sunday Clemson was forced from a zone to man (person?) after only one quarter as Durr, Carter, and Evans began to pick apart the Tiger defense from outside. It’s not likely that Syracuse will give up so easily, but it is another opportunity for a Cardinals team averaging 38.4% from beyond the arc to show their stuff. As for the Orange, they’re not ones to shy away from the the outside by a long shot. Nearly 30 three-point shot attempts per game has resulted in 32% shooting from beyond the arc. 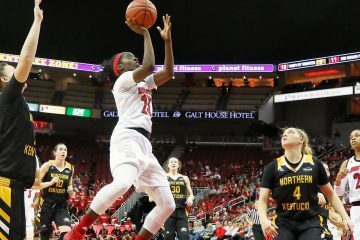 While that’s not impressive accuracy, Jeff Walz said in Wednesday’s presser, “If you only make one-third of your threes that’s like making 50% of your twos.” Syracuse’s Mangakahia and her ability to work off the screen is dangerous as it opens up opportunities both inside and outside. Forwards Drummond and Strautmane have no reservations in terms of shot selection. They’ll fire it up from outside or take the pass off the roll for an easy two. 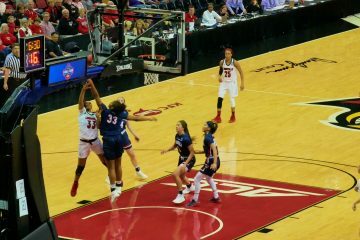 Good communication and scrappy defense like that which Arica Carter has been supplying will be needed to push the Cardinals past ‘Cuse. 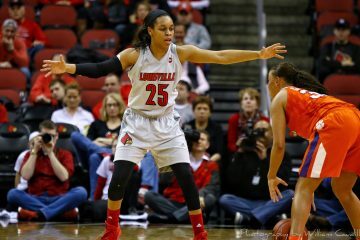 Asia Durr is now second in the ACC and 15th in the country with 20.8 points per game, and was tagged in the late season Wooden Award Top 20. Her 24 points against UConn helped grab her espnW Player of the Week honors as well. Over the past seven games, Louisville has reduced their points allowed average from 64.3 to 59.3. A third quarter with zero Clemson field goals certainly didn’t hurt. Before adopting Otto the Orange as a mascot, Syracuse was known as the Saltine Warriors. No word on whether their playing style was zesty at the time. 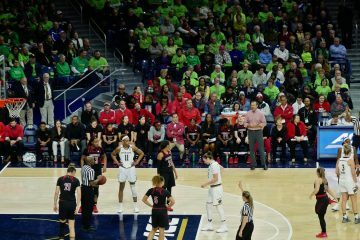 Louisville’s averaging ~9,500 in attendance per home game, which is probably in the top three nationally. Keep it up.